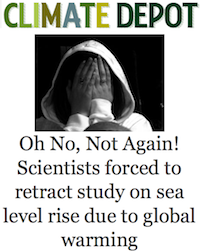 Study that underestimates sea level rise pulled, deniers cheer… huh? Want proof that deniers are not making scientific (or even coherent) arguments? Well take a look at their reaction to a study by Mark Siddall et al. that was recently retracted. Actually we need to go back a bit further to when this particular study was first published. At the time deniers were ecstatic, because the study, Constraints on future sea-level rise from past sea-level change, predicted an estimate of sea level rise of between 7 and 82 cm for 2100, lower than the estimates of several other studies and even a report by the Bush administration. And while this estimate is similar the the IPCC report, the IPCC omits sea level contributions due to increases in the rate at which ice sheets melt as the climate warms. This gave the deniers some support to the notion that sea level rise was not something we needed to worry much about, and they promoted it heavily, even though a rise of 82cm is still worrisome for millions of people around the world. However it didn’t take long for flaws to be found in the study, and the authors did the right thing and asked for their paper to be retracted. Scientists who challenged the possibility of catastrophic sea level rise in coming decades have retracted their argument. Mark Siddall, whose paper claimed sea level rise from global warming could not be more than 82 centimeters (32 inches) by 2100 — despite other estimates of up to 1.9 meters — asked for the conclusions published in 2009 in Nature Geoscience to be retracted, accepting corrections from researchers who had made the higher estimate. Now, thanks to a misleading headline in the Guradian (bad headlines are becoming somewhat of a trend) which incorrectly casts the entire notion of sea level rise in doubt, deniers are tripping over themselves claiming that this somehow casts doubt on global warming. Or more accurately that global warming is not the threat it is made out to be, but most deniers don’t bother with such distinctions. Nothing could be further from the truth. This study’s estimates were low compared to other studies that have been published; the fact that it has been retracted lends more weight (though the question of how much sea level will ultimately rise is not yet settled) to the possibility of more seal level rise, not less. a later study using similar methods to Siddall 2009 [which was just retracted] came to dramatically different results, estimating sea level rise of 75 to 190 cm by 2100 (Vermeer & Rahmstorf 2009). Why the discrepancy? Judging by the acknowledgement in Siddall’s retraction, one speculates that Vermeer and Rahmstorf discovered flaws in Siddall’s methodology and notified the authors. Siddall saw that the errors undermined their results and retracted their paper. So we have two papers using similar methods – one predicting low sea level rise, the other predicting high sea level rise. The low sea level rise is found to be in error. While some are spinning this result to imply no sea level rise, in actuality it increases our confidence in high sea level rise. Vermeer’s results are confirmed by another study that approach the sea level question from a different angle, examining the dynamics of calving glaciers (Pfeffer 2008). The conclusion was a predicted sea level rise of 80 cm to 2 metres by 2100. Further evidence of the ice sheets’ high sensitivity to warmer temperature comes from paleoclimate studies of the last interglacial period 125,000 years ago. At that time, global temperatures were around 2 degrees warmer than now. This is the amount of warming expected for some of the lower emission scenarios. At that time of the last interglacial, sea levels were at least 6 metres higher than present levels. So while we expect sea levels to rise up to 2 metres by 2100, they will continue to rise afterwards to at least 6 metres. Hardly something you would expect deniers to highlight. This exposes a few things about deniers. First they don’t bother to read much past the headlines, or check the original source. Had they, they would have seen that this retraction is not something they would want to promote. Secondly their arguments are not required to be consistent. One cannot cheer when a paper is published, and again when it is retracted and remain consistent. Either the paper strengthened your case, and thus its retraction weakens it, or vice versa. And most importantly, the fact that deniers use the self-correcting nature of science as evidence that the science is wrong, shows that they have no interest in promoting truth. Mark Siddall did the right thing when he asked his paper to be retracted, as did the scientists who first discovered the error. It is this property of science that makes it valuable. Anyone criticizing the self-correcting nature of science is not interested in the truth, only in scoring cheap political points. The response which is overestimated is this flattening of sea level rise, not sea level rise itself. Remove that overestimated flattening and the sea level rise estimates … rise! and it has a BIG river running through it, ~sea level; I’ve several times walked along the Bund there. One of the zingers that people don’t think of much (except the Dutch) is that when sea levels rise, it’s one thing to be San Francisco, and it’s another to be one on an alluvial plain with one or more big rivers, i.e., it’s not just coast that needs dikes, one has to go up the rivers as well. I’ve taken the lowest, most conservative figures I could find. Predictions vary widely. This is because there are a slew of different climate changeprediction scenarios. Each one foresees a particular range of sea level rises, depending on ice-melts, temperature rises and many other factors. It’s not an exact science. The key sources are Sea Level Rise Explorer , studies from the Potsdam Institute (PDF) and reports from the IPCC Report (2001 – the most conservative one). I do not agree with using TAR instead of AR4. TAR is 9 years old, and the science has advanced since them. It has advanced since AR4, but less so. In regards to dykes and rives this is something I know quite well, given that I grew up in Richmond, BC (just south of Vancouver). It is located in the Fraser river delta and is surrounded by dykes to prevent flooding. Much of the area just south of the Fraser river also has dykes for this reason. The amount of low lying land by the Fraser isn’t huge, but it was enough to make it clear that dykes along the coast isn’t enough. L.A. kind of jumps out as being misrepresented. Only very small portions are that low-lying. Most of San Francisco is also much higher. Also, that complete-melt map looks to be showing way too much inundation. The upper Mississippi valley region, e.g., has an elevation in the 500 meter range. IIRC maximum inundation wouldn’t even reach Memphis. They should be much more careful with this stuff. hmmm… Given the errors I may just remove the graphic. Will think about it. Also this graphic presents the issue as being chased up the beach, when in reality the issue with sea level is quite different involving an increase in frequency of extreme storm surges. At least that is how I understand it. Well, I think the graphic is a good idea, even if pieces seem wrong. Constructive commends may lead to a more useful graphic. a) I’d love to have the version where each city was shown as a diagonal line, if one had the data on how much of the city is at what altitude. That wouldn’t be trivial, but would help. b) the other thing is the timescale…those year labels are way too precise-looking visually. a) In some places, storm surge is *the* issue. The US Coast from Texas to Maine, is certainly relevant. b) In some places, saltwater incursion into acquifers is important. c) In some places the issue is marshaland preservation. d) In some places, the issue can be infrastructure that naturally wants to be near sea-level, like the the sewage plants located near sea-level around the San Francisco Bay. Sewage naturally flows downhill, so people tend to put such plants low. See SFBay Flood map. It is worth knowing that several of the main highways (Rt 101, Rt 237, I880) would be partially flooded with +1m rise… Nobody will let that happen, but even +1m will be very expensive. e) In some places, the river-dike extension issue occurs, sometimes combined with b). Yes, I think it’s fair to say that most inundated real estate would get hammered to bits by storm surges before it technically goes under, although in the case of the vulnerable portions of the listed cities the end might come in the form of catastropohic dyke failures or abandonment/dismantlement in the face of such. Also: Taiwan is sunk at 20 meters? Well, probably they mean Taipei, but it’s another obvious error. It’s a nice graphic approach if they could fix the problems. I recall seeing suitable alternatives around the web. BTW, in all the excitement about the retraction, these new results got missed. 2 meters/century starts to look more like a minimum for the near future, noting that the 20 meters/ky wouldn’t be even and that current forcing is much stronger. The PIG having lifted off its stable grounding line is another hint. You could emphasize the text in the lower right corner of the image — they are talking about how much sea level rise will cause flooding in the lowest areas of each city. I don’t know if they’re also assuming a high tide and storm surge on one extreme, or simply assuming having the sewer outfalls backed up and water shooting out of manhole covers and flooding streets, which I’ve seen in San Francisco due to ordinary storm surges coinciding with high tide and intense rain at present sea level. The graphic’s not great; the contour maps are better. 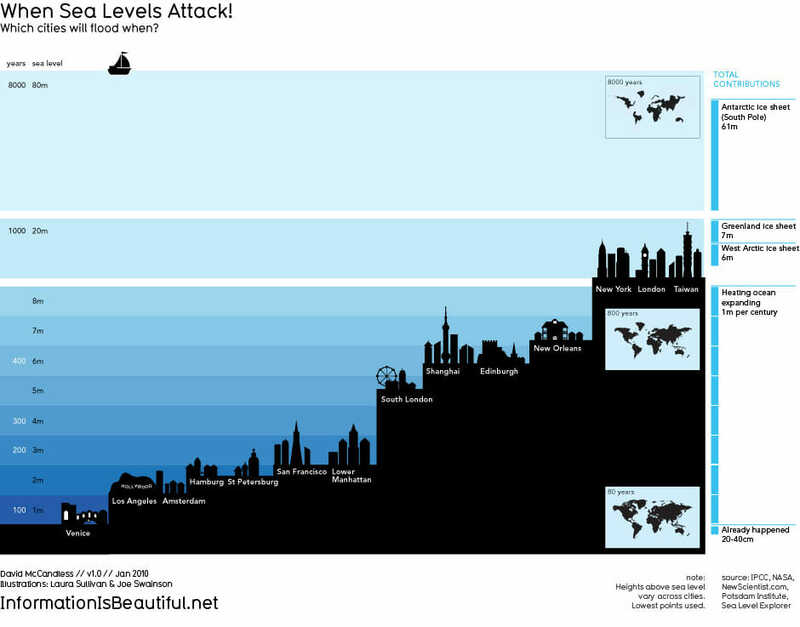 Another good comparison, look at how Japan fared yesterday with a sea level rise (the tsunami) of a bit over one meter. Thanks for pointing out the text in the corner, Hank, but in that case I’m left to wonder what part of L.A. is more vulnerable to SLR than the Marina District. BTW, a point that’s almost never made is that the greatest cost of rapid SLR isn’t our real estate but estuary productivity. That one’s going to hurt and keep on hurting for a long time since estuary ecology doesn’t recover at all quickly. Neither will the tropical coral reefs, for that matter. A wealth of information. Thank you. As usual something like SLR is not nearly as simple as it first appears. There are many effects to consider, but even the simplified view is scary enough! Going to have a look at the two papers Steve Bloom mentioned, doesn’t look good. I really want the science to point to less SLR, but that is not happeneing. I also want to make it clear that the graphic is not mine, rather it comes from David McCandless of Information is Beautiful. Not sure of that was clear from my post (the image credit is at the bottom of the post, but above the update… hmm I should change that. I left a comment on his blog conveying the issues brought up here. Will post if he replies. ScruffyDan, would you please define, “deniers,” a word that appears many times in your article? I’m an AGW sceptic, but I know climate changes, therefore I’m denying nothing. I don’t know anyone who denies anything to do with climate change and have read nothing written on the internet by any denier, apart from the odd imbecile who has difficulty typing their own name, and they’re excused. I explain the difference here. Basically, there are few real skeptics left, most have been convinced of the overwhelming evidence in support of AGW. A few years ago I would have called Lindzen a skeptic, now I am more inclined to call him a denier. Hans von Storch is still what I would call a skeptic. I think. I don’t follow him that closely. There are some uninformed skeptics, who are skeptical of the science because they are unfamiliar with it. These people, if they are true skeptics, are keen to accept new information and adjust their views accordingly (James Randi is a prime example of this). Deniers are just that. They deny the science. They cherry pick, and they twist the truth. They cling to anything they think might support their case (as I wrote in my post) and many of their arguments are contradictory. You could be denying the many attribution studies which point to our GHG emissions as the cause of the recent warming trend. Of course since I don’t know you, I cannot really say. But the fact that the climate changed in the past doesn’t mean that humans can’t also change it… in fact it means that the climate is sensitive to external forcings like GHGs amongst other things. Like most sceptics, I was originally a believer, because initially there was no reason for ordinary people like me to doubt ‘the science’ at all. I’ve learned that true scientists are sceptics of their work and that of any other scientist, but we have Hansen and Mann, to name only two of the band of brothers who no longer appear to be very sceptical of their work, even though some of their predictions haven’t come to pass. In science there is always doubt, most especially the complex science of climatology and although it’s a fairly old science, it is still in it’s infancy and has yet to get past the crawling stage of its life. There’s too much left in doubt as yet and rushing headlong into saving the world by reducing one particular GHG that has yet to found guilty of causing GW or CC is sheer lunacy. I’ve read many times that believers believe to ignore it could be worse and that it could cost more in the long term, but in the 30 odd years that this fear has been built up, no one has yet seen any real evidence of the promised future catastrophe getting under way. After all, it’s not like a religion, where one is expected to believe in whichever chosen god without seeing, or is it? An English High Court Judge ruled that belief in it can be classed as a religion, but he isn’t a climatologist, so his ruling counts for nothing I suppose. I intentionally left out any mention of the Goracle or Climategate etc, as I decided it was best not to embarrass any believers who read your blog. As for the Jones’ boy, I’ve decided to let him recuperate for a while before putting him back in the pillory. but we have Hansen and Mann, to name only two of the band of brothers who no longer appear to be very sceptical of their work, even though some of their predictions haven’t come to pass. First I’d like to know which predictions haven’t come to pass, and what uncertainty they attached to those predictions. But before you do that (since I think I know where you are heading please read this, and this). Oh and don’t bother with the whole hockey stick is wrong baloney. The National Academy of Science looked into it and agreed with it, as have over 10 independent reconstructions that have been conducted since. Secondly the body of evidence supporting AGW is so large that even if Mann and Hansen were discredited it wouldn’t disprove AGW. It seems to me that you are conflating contrarianism and skepticism. Skeptics change their tune, and accept something when the evidence supports it. A good analogue is found in evolutionary biologists. They speak of evolution as fact, not because they are no longer skeptics, but because the evidence supporting it is overwhelming. Sure there is uncertainty (just read the IPCC, it never assumes certainty), but the opinion of every single relevant scientific society (plus 97% of climatologists) is that the uncertainty that remains is likely small enough not to significantly change the big picture. Claiming otherwise, means that you are either not informed of the scientific consensus, or you deny it. but in the 30 odd years that this fear has been built up, no one has yet seen any real evidence of the promised future catastrophe getting under way. That is simply false. In British Columbia our forests are dying (it can be seen from space) because of the pine beetle. Normally cold winters keep its populations in check, but that isn’t happening anymore. Then there is the fact that the ocean is getting more acidic, and the bleaching of coral. And we have the increase in both floods and droughts (not they are not mutually exclusive) that have occurred in the past decade. And so far we haven’t warmed that much. I is expected that under business as usual over the next century we will warm much more. Got a source for that? Unsourced claims wont do you much good here. The only English court ruling I am aware of regarded an Inconvenient Truth to be broadly accurate, despite the fact that most media reports claimed the opposite. It is always a good idea to read the original source. But regardless, I don’t believe in AGW, I accept it. There is a world of difference between the two. Thats probably smart of you, because Gore isn’t a scientists and nothing he does or doesn’t do impacts the scientific evidence for AGW. And the thee inquiries that have looked into climategate have all found no wrongdoing. Your response will do along way in either justifying your claim of skepticism, or destroying it. And there was I, thinking you were knowledgable of all the basic facts on climate change. “In a landmark ruling, Mr Justice Michael Burton said that “a belief in man-made climate change … is capable, if genuinely held, of being a philosophical belief for the purpose of the 2003 Religion and Belief Regulations”. A dumb ruling in the UK doesn’t qualify as part of ‘the basic facts on climate change‘. This ruling has zero implications for the science supporting AGW. Nor does it apply to me, since I am not in the UK, and as I explain above I don’t believe in AGW I accept it.